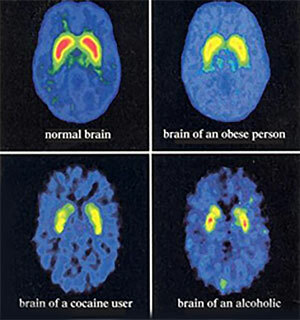 What do the colors on these brain scans mean? Food is used by many, just as drugs and alcohol are used, in the quest to release dopamine and feel pleasure. Acupuncture releases the neurotransmitter dopamine, and creates a sense of pleasant satisfaction, without food, drugs or alcohol. The Acupuncture component of my program is the key to helping you to keep the weight off permanently. Habits are like riverbeds. Every time it rains, the water flows down the same pathway. Acupuncture effects neurotransmitters in the brain and actually forges new pathways for your vital life energy called “Qi” to flow. I use microcurrent technology rather than needles in my clinic. This enables us to target specific acupuncture points with proven frequencies for superior results. All of the acupuncture points used in my weight loss program are on the outside of the ear. 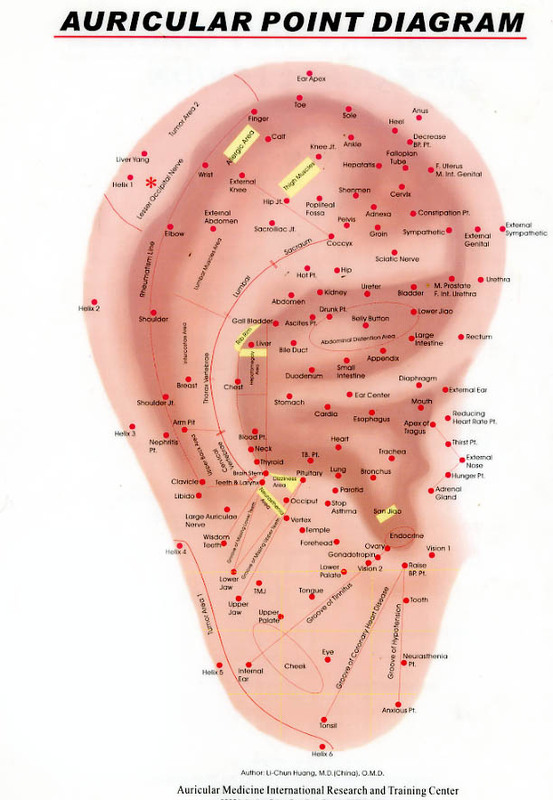 There are over 200 acupuncture points on the outer ear. The outer ear acts like a switchboard to the brain and each point triggers electric impulses from the ear, via the brain. Auricular therapy blocks messages to the brain that call for more food or eating. Other points strengthen the will power, up-regulate hormones that make you feel relaxed and satisfied. This creates ideal conditions for losing weight if you follow a reduced-calorie diet. The diet is what actually allows you to lose the weight, but auricular therapy allows you to stick to the diet much more easily then you normally would. Behavior Modification: This is the most important part of losing weight and keeping it off and also where most other weight loss programs come up short. By changing the flow of “Qi” or vital life source, acupuncture can actually change behavior patterns and habits for lasting weight loss. Some of the points that we use are part of the NADA (National Acupuncture Detoxification Association) protocol, which was developed in 1985 at Lincoln Hospital in New York City for the treatment of addicts. The technique is now taught at Yale University School of Medicine, Department of Psychiatry. Research shows that when an attempt at changing habits is rewarded by dramatic positive results, lasting change is almost 80% more likely. Losing approximately 10% of your total weight in 26 days definitely fits the criteria! Release Endorphins: With diet changes, many people experience cravings, (although the formulas we supply will keep this to a minimum) Cravings are often due to lack of endorphins, rather than true hunger. Acupuncture will help to balance out the cravings by helping the body release endorphins and will flood the pleasure center of the brain with the neurotransmitter dopamine. Dopamine triggers reward and motivation circuits in the brain. You may not be able to feel it, but you will find it amazingly easy to stay on the diet. Regulate Hormones: Acupuncture helps to up-regulate hormones that signal your brain that you are full, and down-regulate hormones that make you feel hungry. Reduce Stress: An increase in the “stress hormone” cortisol can alter metabolism. Cortisol also causes us to retain belly fat. Through the release of endorphins, the “stress hormone” can be neutralized with acupuncture. Support Digestion: Acupuncture supports the body to generate an efficient digestive process. Increases Metabolism: Auricular (ear) acupuncture has been shown to increase basal metabolic rate and suppresses appetite via effects on the autonomic nervous system. Improves Insulin Resistance: There is some data supporting acupuncture’s effectiveness on addressing a condition called insulin resistance, which is associated with metabolic syndrome. Altering activity of the sympathetic nervous system and possibly correcting the insulin signal defect do this. Appetite Suppression: Electro-acupuncture influences the hypothalamus and obesity-related hormones to promote appetite suppression.